Well Deb has arrived and I have to say it is a huge delight to have one of my girls around all the time! We have been sight seeing, eating decadently, with only more of the same in sight for our weekend in Paris. Today we headed to the Victoria & Albert Museum after the school drop-off. On our way we had breakfast in a french boulangerie, took in the Harrod's windows and then stopped dead in our tracks. 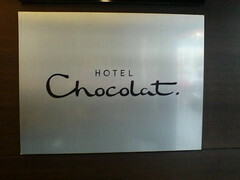 Across the way we saw....and I pause here to give it its moment of due respect.......the Hotel Chocolat. We were pulled in by a force greater than us. The most elegant, modern and exquisite presentation of all things chocolate I have ever seen. The young girl working brought around a tray of samples for us. I wanted to take the tray, open my purse, and dump. We both made a little purchase and left totally indulged. My favorite was a taste of Aztec - dark chocolate with chili....smooth with just a hint of heat. To top it off the Victoria & Albert Museum is my favorite so far. I was only able to spend 45 minutes before leaving Deb to go get the boys from school, but I will definitely be back. Along with a stop once again into chocolate heaven.